Portraiture for dobe Lightroom eliminates the tedious manual labor of selective masking and pixel-by-pixel treatments to help you achieve excellence in portrait retouching. 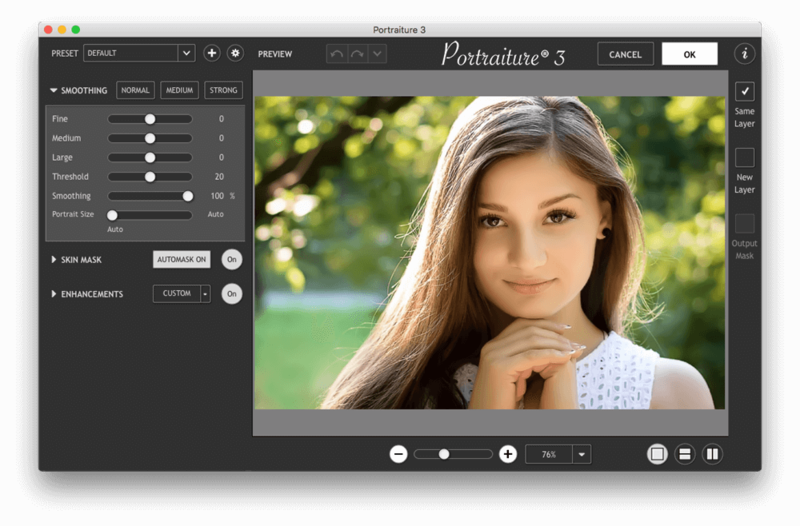 Imagenomic’s Portraiture is a powerful but user-friendly plug-in for Lightroom. It’s an effective tool for smoothing skin while maintaining texture for realistic results—a fine line that all portrait photographers must be aware of. The program automatically detects the subject’s skin and creates a mask, which can be tweaked if needed. There are plenty of options for refining the portrait with tools to adjust hue, saturation, luminance and latitude. A separate Enhancements panel provides sliders for a range of parameters including sharpness, tint, brightness, and contrast for fine-tuning the overall look and feel of a portrait. And if you’re not sure exactly what you want, the program has a bracketing feature so you can choose from several variations of the same image. A handful of presets are available to get you started but you can create and save your own, along with a space for your notes so you can mix and match them each time you shoot a portrait under similar conditions.